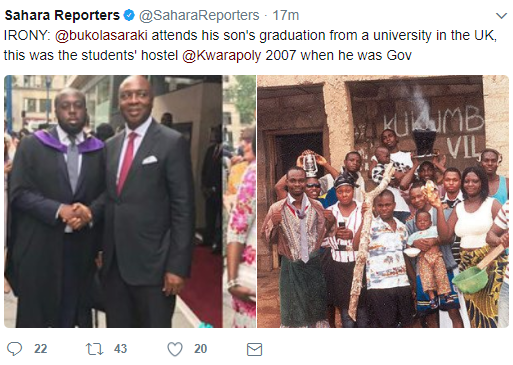 Saraki Case Study: Why Is It Hard To See Politicians Kids Study In Nigeria? July 15, 2017 – Saraki Case Study: Why Is It Hard To See Politicians Children Study In Nigeria? 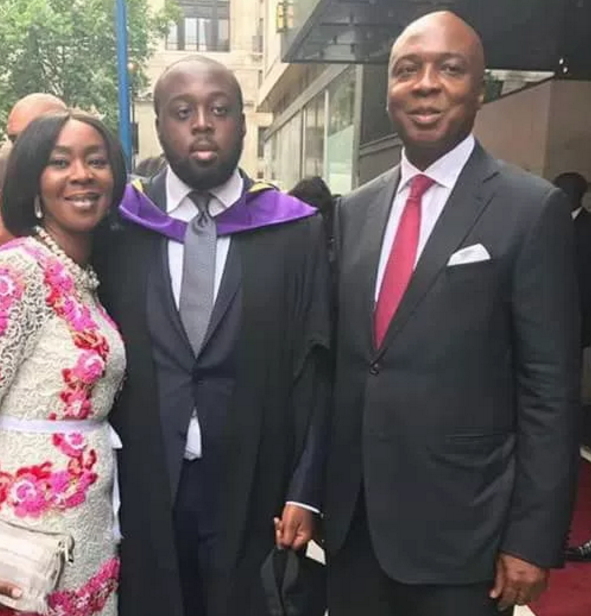 Senate President Saraki came under heavy fire by Sahara Reporter after he shared photos of himself at the graduation ceremony of his son, Seni Saraki who just graduated from London School of business. See how Sahara ripped Saraki apart on Twitter. Nigerian politicians are fond of sending their children to study at best institutions abroad while they continue to play game with the future of youths in Nigeria. Their children are far away living a good life and acquiring a better future in abroad while the youths in Nigeria battle unemployment and uncertainty… Diaris God ooo. It is so degrading and shameful that despite the fact that our education sector top the list of our national budget in the year 2017,having an upward of 400 billion of naira injected into it followed by defence,the quality of our education in nigeria continue to decline like never before with inadequate facilities and age-old equipments stored in many institutions across the country thereby inpeding the academic prowess of our students.In the face of this helplessness on the part of many nigerian students in there various institutions,our politicians continue to send their children to prestigious schools in overseas so they can aquire advance education thereby leaving ours in shamble and in dilapidating state. The question we need to seriously ponder over is,why are our politicians busy sending there children abraod for education? It’s simply because they are corrupt and do not believe in our education they so much promised heaven and earth to deliver on.This is why people like saraki among others could send their children abroad for sound education. until all nigerian students including the children of our politicians are conditioned by law to attend our institution here in Nigeria,our education sector will continue to suffer and never attain the expected standard. Another criminal in making, God judge all of you.